According to the locals, during rainy season (we were there in March), all the rubbish is washed into the the sea from the mountains and from the other islands. 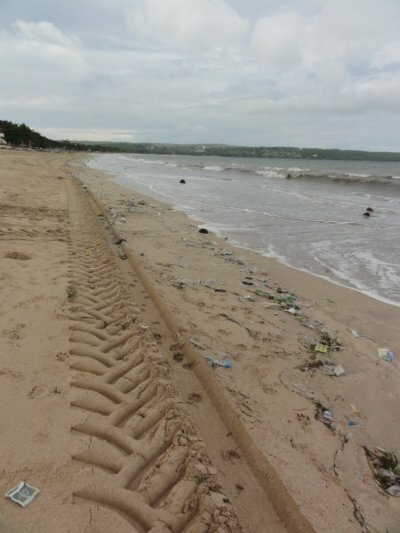 No doubt about it, Jimbaran had the dirtiest beach we have seen in our entire trip! Kuta and Legian is not any better. Despite the rumors that the dirty water can even be dangerous and cause skin problems, hordes of Australian surfers reside here. There are so many tourists and so many locals trying to sell their stuff with an aggression that we probably haven't seen since Mexico, that the image of Bali, the paradisiacal island vanishes right away. Add to the mix that the city of Kuta and its surroundings have grown so rapidly in the past years, that the roads are not capable of taking up all the traffic. In peak times it could take an hour to pass a few kilometers inside the city. Your best bet is a motorcycle taxi, which will take you anywhere, slaloming between the jammed cars. Reportedly, due to the rapid development, fresh water supply, sewage treatment and electricity are not always available. Taking all this into account, we rapidly left Kuta-region behind and headed to the center of the island, Ubud. The good news is, that Ubud is a little bit less crowded, yet you see handicraft sellers (wood and stone carvers, potteries, etc.) on every five meters. Thinking about the general rule of economy about supply and demand, we can’t help wondering: who the hell buys all this stuff? Surrounding Ubud there are a number of temples and holy places one can visit. The general scam applies to most of them: they try to sell you a sarong (basically a long apron) before you enter the place, for religious reasons, but you will soon learn that most places offer you a free sarong and it is included in the entrance ticket. Similarly a self-appointed guide often tries to stick to you and ask for money later. If you are not in the mood, just tell him/her, you have no money. At most places you can avoid these people quite easily, but be prepared when going to the temple of Besakih, scammers are more aggressive here than usually. Apart from the temples and handicrafts, Ubud region is known for its monkey forest, Balinese dance performances, rice paddies and the majestic Mt Batur. Generally Bali has great food and drinks, but stay away from the local strong drink, called Arak and the self service buffets which can be quite low quality. During our stay in Ubud, Meme’s and its friendly manager, Nyoman treated us with delicious plates and yummie fruit juices. After all Bali is worth a visit for its rich cultural heritage and its unique religion, but I would not recommend it for honeymoons or relaxing holidays. 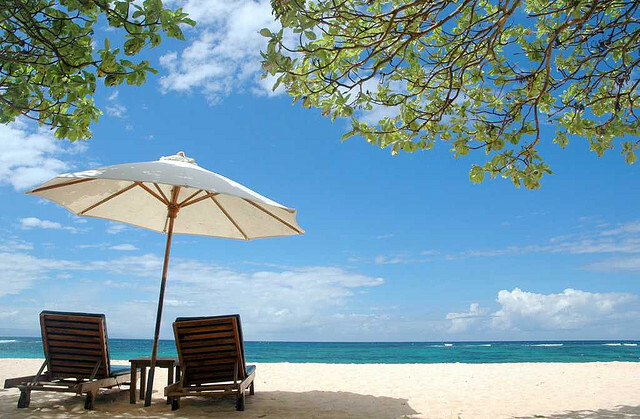 For sure Bali offers a number of great hotels and resorts for great prices, not only near the beach, but also inside the island, but as soon as you step outside, the peace is gone. You will not find answers here for your mid-life crisis, like Julia Roberts did in the movie “Eat, Pray, Love”, and there are definitely better places to enjoy beach time.